Integrating screenshots of Google Maps and using Flickr notes, Memory Maps are visual representations of one’s memories, an annotated satellite view of places steeped in personal meaning. I found out about Memory Maps on Lifehacker, and decided it was worth a try. After all, I’ve had an interesting childhood, moving around to different countries, and so forth. Check out my Memory Maps photoset on Flickr. The Memory Maps group is worth perusing as well. What Are You Really Putting On Your Body? The Environmental Working Group (EWG) has created a safety report on the numerous substances we use for body care. The site allows the visitor to search through numerous brands and find out what poisons they are using on their bodies. It’s fascinating and (not just mildly) frightening. Tomatoes in Mid-air, originally uploaded by aaroncorey. 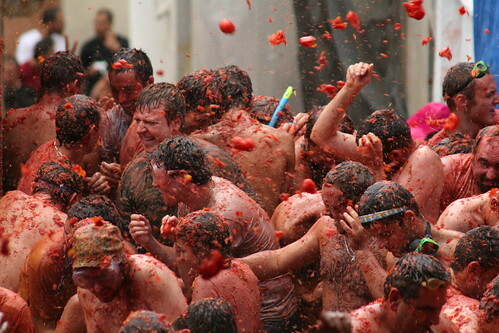 Buñol, Spain hosts the annual Tomatina festival, during which the streets erupt in a frenzied tomato fight. I first remember hearing about this about a decade ago, and since then I’ve always wanted to partake in this fascinating waste of food. I’ve been feeling quite depressed lately, and decided to do a search for Chinese Medicine and depression. What I discovered was an interesting approach. While Western head shrinks are quick to prescribe drugs for depressive symptoms (often with catastrophic side effects), Chinese practitioners suggest depression results from repressed emotions, such as guilt or anger. Their treatments seek to release these emotions in order for the patient to study them and let go of them accordingly. Acupunture, acupressure and traditional herbs are their route. I’m going to check this out, or spend an infinitude of days suffering this terrible indignity.